Create perfect BIM from reality capture data” is the credo for the new FARO software brand, As-Built, offering products with most complete functions, most effective workflows, most innovative technology and best in class profitability. Rugby, June 24th, 2018- FARO® (NASDAQ: FARO), the world’s most trusted source for 3D measurement and imaging solutions introduces the new software brand As-Built. The FARO As-Built software supports AEC customers in the efficient and comprehensive evaluation of real building, plant and infrastructure data acquired via various measurement sensors, such as laser scanners, hand scanners, drones, cameras or total stations. Thanks to As-Built, classic CAD programs are supplemented by additional evaluation functionality and thus considerably accelerate the 2D and 3D documentation of as-built data. 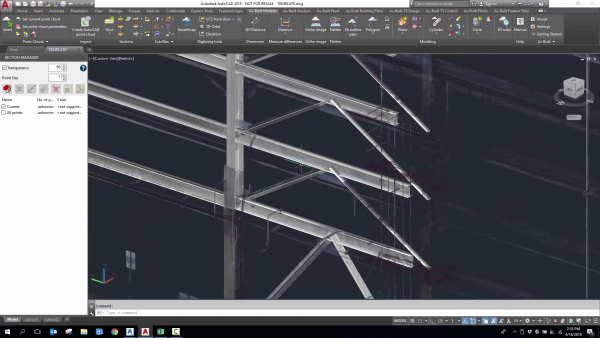 As-Built for AutoCAD® Software* was specially designed for AEC users with cross-industry surveying tasks and offers a range of functions that is unique to the market. Whether for documentation of streets, bridges, industrial plants, excavations, monuments or buildings – As-Built for AutoCAD® does the job. In addition to the simple management of large vendor-agnostic scanning projects, users can quickly and easily crop basic geometry, such as polylines, 3D contours or planes. Commands for drawing and dimensioning of building elements allow a quick completion of generated 2D plans, which can then be enriched with further information in a structured manner via room book. The software offers plant planners and maintenance service providers intelligent tools for automated and catalog-based pipe and steel modeling. Numerous analytical tools support the visualization of model deviations to the point cloud and enable further inspection, such as the volume calculation for tanks. In addition to pure point cloud evaluation, As-Built for AutoCAD® Software users can also use photos or total station data to supplement their as-built data. These serve among other things for the creation of true-to-scale image and mapping plans, as starting point for the positioning of laser scans or for staking out CAD reference points in the real project environment. With As-Built for Autodesk® Revit®**, FARO provides architects, civil engineers, construction specialists and facility managers with an efficient tool set for evaluating 3D laser scan data directly in Autodesk Revit®. Thanks to special tools, buildings, structural elements and surrounding terrain can be quickly, automatically and manually converted into intelligent BIM models. 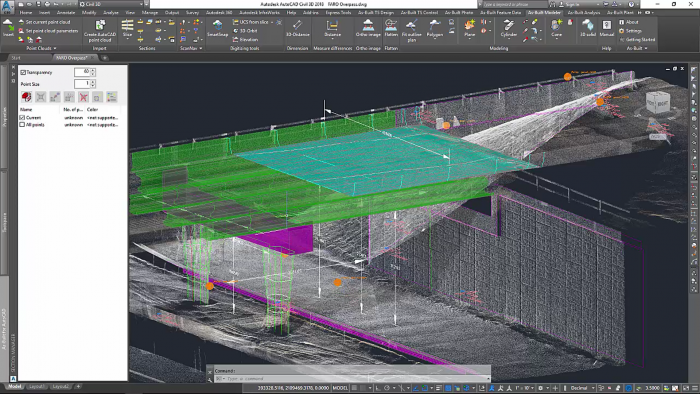 An integrated section manager allows users to crop and orient within the point cloud with ease. The fast and precise cutting and alignment of walls, pipes and steel beams to user-defined tolerances allows floor levels and technical room elements to be created in minimal time. Numerous design aids facilitate the creation of 3D model lines and modeling points through real 3D point snap. Accuracy tests between BIM model and reality are ensured by an integrated surface analysis (even according to USIBD). The option to create new Revit® elements in the family editor also allows users to model non-standard elements. The FARO As-Built Suite combines the As-Built for AutoCAD® Software and As-Built for Autodesk® Revit® functionality as well as other products in the future under the As-built platform. The software package is particularly suitable as a carefree solution for service providers who provide clients with various target programs and have an increased need for flexibility in data evaluation. Regardless of which product variant is used, users always benefit from seamless integration of their FARO Focus and Freestyle data into the as-built environment. In addition, data formats of all common manufacturers (such as Leica, Trimble and Topcon) are supported. “We have been uniquely focused on delivering 3D digital surveying solutions that address the key pain points of AEC professionals; specifically, waste and project delays that lower productivity and increase operational costs” states Andreas Gerster, Vice President Global Construction BIM. *As-Built for AutoCAD® Software includes the functionality of all earlier PointSense for AutoCAD products and other AutoCAD plug’ins, such as PhoToPlan and TachyCAD.